Posted by Angel Dan on 11/26/2018 10:40:20 AM. One reason that I like Kindle is, Amazon allows us to synchronize our Kindle books across multiple Kindle devices and apps. This feature is called "whispersync". This seamless reading experience is so cool. But the fact is that I often meet problems when switching reading between different Kindles. For example, after I read some pages with my Kindle voyage, the Kindle for iPad app didn't recognize where I stopped before. Step 1: Enable Whispersync Device Synchronization on Amazon account. 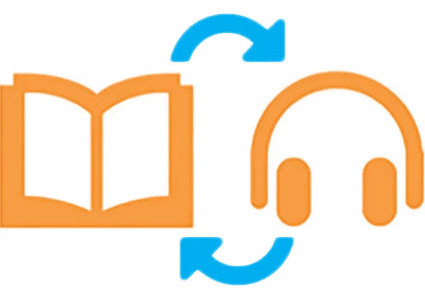 To keep our kindle library in sync, we must turn the ''whispersync for books" service on. Visit Amazon official site and log in with your own kindle account, then go to "Manage Your Content and Devices" and select the "Settings" tab. Set "Whispersync Device Synchronization" to ON under Device Synchronization (Whispersync Settings). This setting will help sync our books automatically. And "Whispersync for Books" is enabled on Kindle Fire, Kindle devices and apps by default. This means you don't have to do anything to get it up and running on your Kindles. Once activated we can go to the furthest page as well as any bookmarks, jighlights and notes. You can also check the "Whispersync for Books" settings on your Kindles. Go to Settings > Device Options > Advanced Options > Whispersync for Books > Enable. Open the Kindle app and go to Settings > Whispersync for Books. Go to Settings > Other > Whispersync for Books. If you still fail to sync across Kindle devices and apps, please continue to read and follow the troubleshooting guide below. Step 2: Check whether the wifi is connected or not. To allow automatic syncing, we must keep our device connected to a wireless network. If it is connected to the internet, but your whispersync is not turned on, delete the WiFi connection and reconnect it please. Step 3: Register with the same account. Please note that only by registering the same amazon account can your Kindles be synced automatically. Somebody will think that the book has been downloaded to the device already, so even though I log in with another account or use other family member's account, this book will be still in the device. But in fact you should know that, all your books are saved in your Kindle library which are linked to your account. Account changed, all books in kindle library will also be changed. If you are sure that you've downloaded the book successfully on several devices but you still can't sync them to the furthest location, a high possibility is because the version of the book you downloaded are different. Log into your settings area in Amazon then you will find that there was an "update" in your book. In this occasion I recommend you delete the book from your devices and then re-download them to Kindles and mark the location in the book! Step 5: Always return to the home screen when finished reading. From Amazon customers' help document, to avoid syncing errors we are told to return to the home screen on our device when we finished reading. I tried to keep on the reading page screen and then switch to my other Kindle, then I found that the furthest page hasn't been synced. Therefore if you finished reading but staying on the page you last read, the page won't be synced on your another Kindle. Tips: If the book is stuck at a certain page and won't budge try to modify the font size, that helps in many cases. Above steps will help resolve 90% of problems about Amazon whispersync. But there must be some people who bought some books from non-Amazon store such as Kobo, and then will find that they don't sync. This is because those books we purchased from other stores are not compatible with Kindle. To use Kindle's whispersync service, firstly we must make sure the book formats are Kindle supported: Mobi or AZW3. Most of books from non-amazon stores are with ePub or PDF (some Kobo books are kepub) format, while Kindle only supports the default Mobi (sometimes azw3 output is also OK). So we are required to convert the books format in advance. The tool highly recommended here is Epubor Ultimate (the best alternative to the Calibre). Supported eBooks: Amazon Kindle, Google books, Kobo kepub and epub, Nook, etc..Please note that the iBooks epub and pdf are not supported. Add eBooks to the main interface. Once books files added, the drm protection will also be removed (which helps you get rid of the eBooks store limitation). Then choose output format as "AZW3" or "Mobi" to convert. When converting finished, you will get your newly books which are saved as kindle formats. Tips: One reader leaves a comment that she found she failed to sync the furthest page, highlights and dictionary after converting to azw3 format, but the Mobi format work. 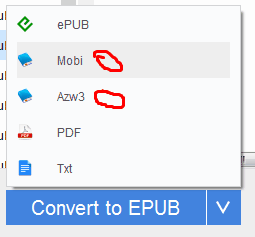 So if you also met similar problems try again to convert your books to Mobi please. In this part, you will wonder that why I should email them to the device but not the transferring via USB. Sideloaded books can be open and read on our device, but if we want to stay in sync, the correct way is to email them. Amazon enables us to send files to our registered Kindle devices, free Kindle reading apps and our Kindle library in the amazon cloud library by emailing them to the Send-to-Kindle e-mail address ([name]@kindle.com). Once the file emailed into Amazon’s server, it gets incorporated into the whispersync function, so Amazon will keep track of where you are in it. Go to "Manage Your Content and Devices" > "Settings" > "Personal Document Settings" > "Edit Archive Settings" > "Enable" > "Update". Then, use an email address from "Approved Personal Document E-mail List" to send the files. You can only send files by using the email from the list. 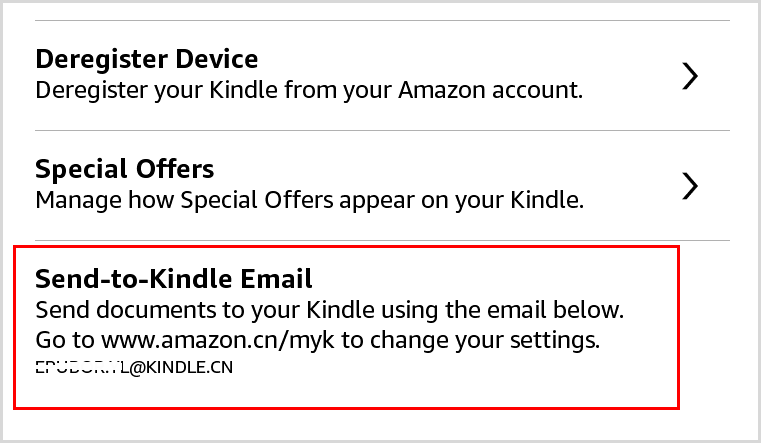 Please note that the Send-to-Kindle email address is different on different devices, though you are using the same account. 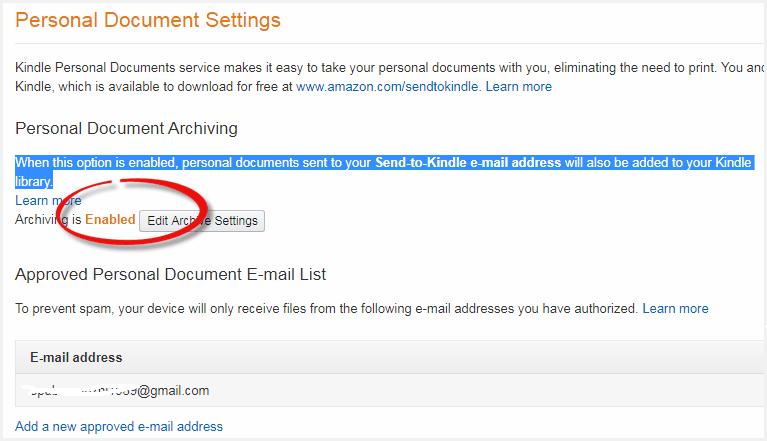 So before sending files you can check the address on your device first: Settings > My Account > Send-to-Kindle Email. The books should then magically appear on your connected devices, like your Kindle Paperwhite or the Kindle iPad app. If you found that the file you sent hasn't arrived on your device, please select "Docs" icon from the list, not the "Books". 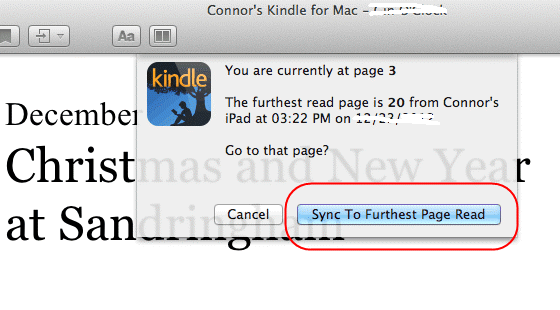 1, This is the official guide to sync non-Amazon purchased eBooks between Kindle, iPad, and iPhone. 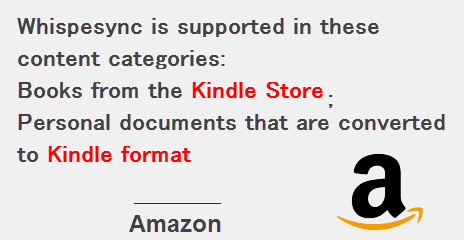 2, This service won't help sync books to Kindle Cloud and Kindle for PC/Mac app. This means we can't read those converted books on computer with Kindle app. If we really want to read them and sync them on computer, convert them to ePub or PDF please and open them with iBooks or ADE. 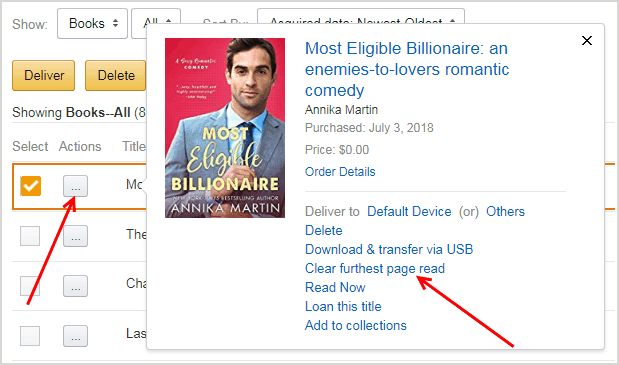 Tips: Amazon also has a desktop app for both Windows and Mac that lets us send files to our Kindle by right-clicking on them on our computer and pressing "Send to Kindle". This is especially handy if you have many books to sync. If you are tired of reading the book, you can switch seamlessly between reading and listening with Whispersync for Voice. But firstly you should own a copy of a Kindle book and a copy of the same title as an audible audiobook (you can buy from amazon's Kindle Books with Audible Narration page). Then just choose one app and open the other, tap the book/ audible audio book to listen or read. Your device syncs your position with the Amazon cloud by default. If by chance you found that the Kindle book and the audible narration aren't syncing, please manually sync your device or refresh. This will immediately check for new positions. If you are sharing an account with a family member, and you are both reading the same book, it's really annoying when he/she finishes a book when you are just starting it, right? Many families share an amazon account so they can enjoy their digital books without having to buy separate copies for everyone. Method 1: Turn on airplane mode. This is the quick and easy option. But sometimes it is inconvenient when we want to do something (for example, use an app) on our tablet or phone. Method 2: Reset whispersync to clear furthest page read. From "Manage your Content and Devices" choose the "Content" tab, select the book you don't want to sync, and click on the "Action" button next to the title of the book. Then a list of options will appear, click on "Clear furthest page read..."
Method 3: Turn syncing off. If you and your husband (or other family members) are reading a Kindle book at the same time, you may don't want to see a prompt every time you open the book to go to the furthest page read, right? If so you can turn off whispersync completely. If just want to stop syncing on one particular device or app, you can do from the settings menu. If you want to stop syncing on all devices, head to amazon account on the web and turn off "Whispersync Device Synchronization". For details please back to the part 1. Method 4: Back up your Kindle books or Audible AA/AAX audio books. Method 2 can not help us un-synchronize just one of our books. But if we can back up our purchases, we can rename these files to note the reader which version to open. For example, angela-for husband, angel-for wife. 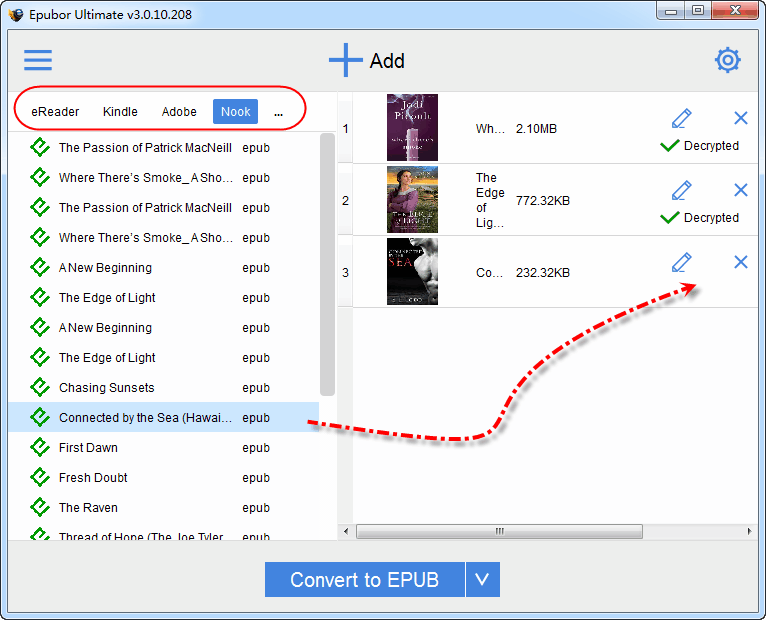 The tool that helps back up Kindle books is Epubor Ultimate. And Epubor Audible Converter will help you back up aa/aax audio files. After you backed up your books, it would be better to rename these books so that you and other readers know which to open. Wish this guide helps you. If you found your kindle whispersync not working, but this article didn't help you resolve the problem, leave your comments or contact our support team please. Angel Dan Joined Epubor since 2013, sales manager for Japanese site (jp.epubor.com) and, also spent 5 years in content marketing, email marketing and business development.